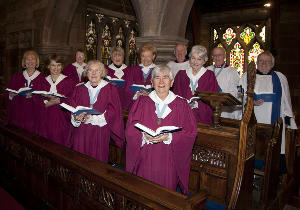 The choir meets on Friday evenings at 7.00 pm. The full choir sings at the main Sunday morning service and a smaller number sing at the evening service. Additionally, we sing at about a dozen or so weddings each year. The choir is affiliated to the Royal School of Church Music (RSCM). An exhibit in the choir vestry records the choir’s membership of the RSCM dating from 31st October 1957. So we have celebrated over 50 years of membership. The RSCM was set up just after the last war to help raise the standards of choral singing in parish churches. Each autumn, the Cheshire diocese branch of the RSCM holds a festival service in Chester cathedral. In the preceding months we learn the music for this, both at our own choir practices and at workshops held across the diocese.